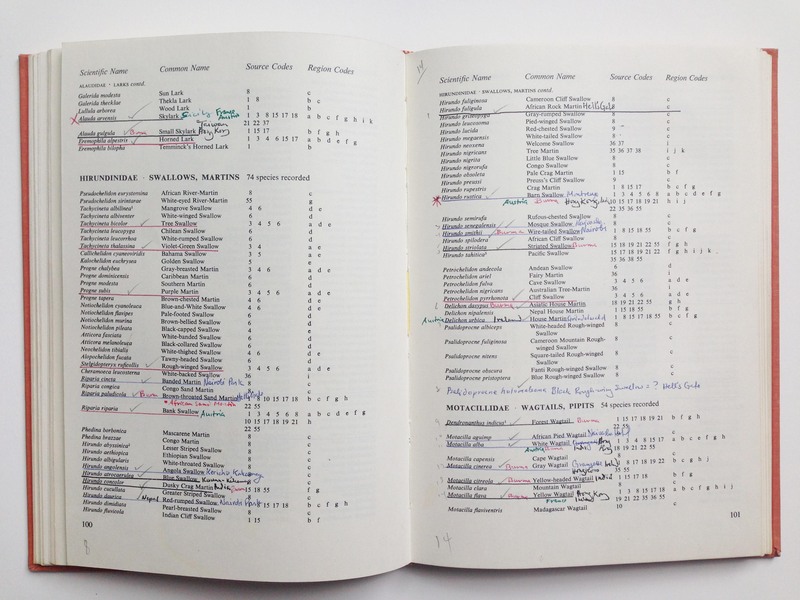 Once upon a time, in 1979 to be exact, there was a list-loving bird-watcher who kept an in-depth check list of which birds s/he spied, and where. 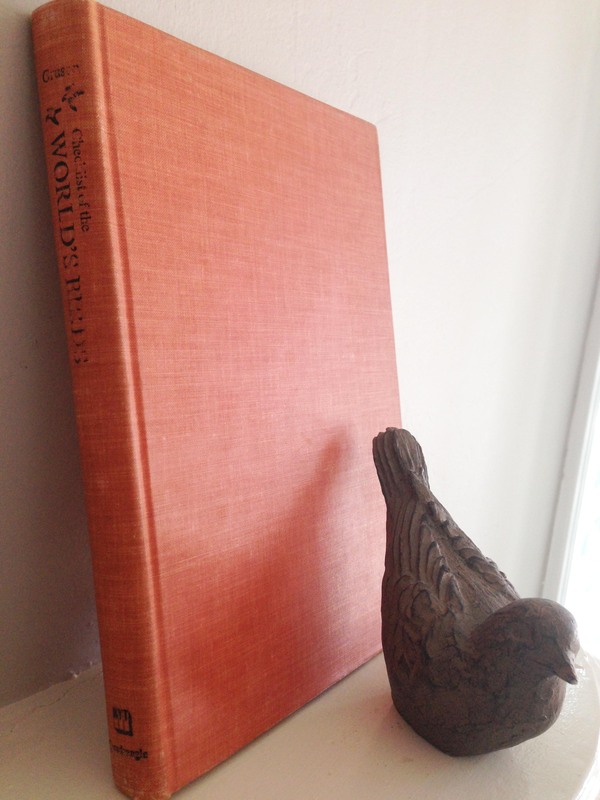 Thirty-five years later, I found this avid ornithophile’s documentation in a slim, orange, hard-bound list of the world’s bird species. I love this kind of memory-keeping; it smacks of my Grandfather’s daily calendar jots—just the essentials. I love that there is no key to the underlining, the red pen versus blue or black, the pencil check marks. 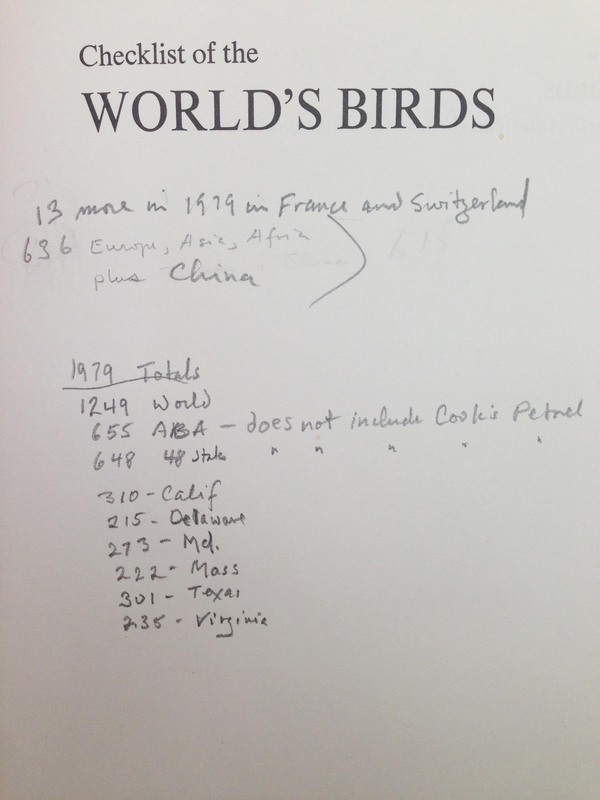 I love the location notations, the mysterious asterisks, the editing of the author’s list with question marks. And equally fantastic is the 1979 tally right inside the front page. Can we just agree that the bird world is broad and diverse? Truth be told, I initially bought this book at the SFPL Big Book Sale with the full intention of dismantling it (in some beautiful, honorable way—I swear)! But now, I cannot. It’s a treat to browse, even in its crypticism. Now, I’m so fresh to this whole World of Birds, so bear with me when I share this nugget: when I hopped onto Amazon to see if this book had value (outside of its sheer aesthetic and divertissement), I discovered there are modern versions of birder lists! Hundreds of lists by state, by country and continent, and of course, a global list. Today I’m sharing Florida, Georgia, Hawaii, and Idaho. Here is my second attempt (of five total) of the Mockingbird. I can’t wait to compare all five at the conclusion of this project. 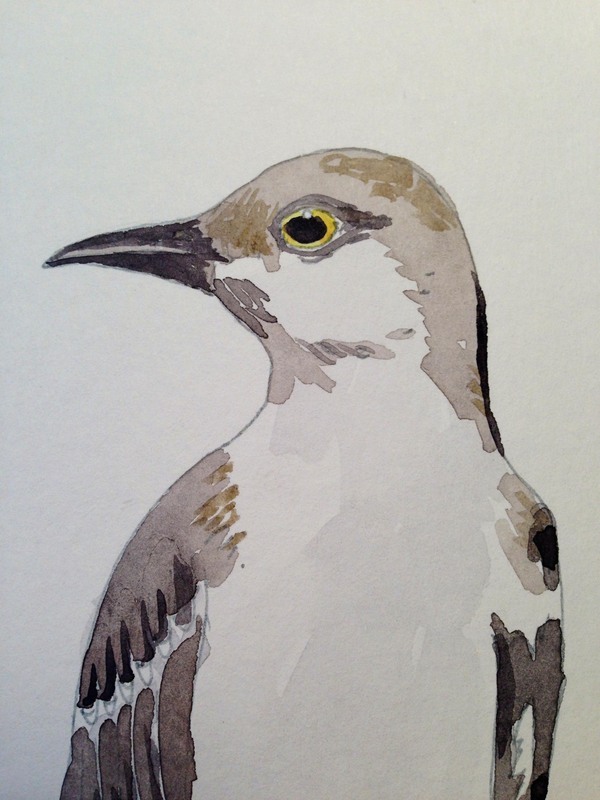 I watched some mockingbird videos so that I could learn to identify their calls. The orange blossoms appear to have thick, luscious petals—is that true, orange tree-keepers? I imagine they smell as heavily perfumed as the lemon blossoms, which are a little more common here in San Francisco. And as I drew Florida—a state I’ve never visited—I was confounded by all the barrier islands protecting the peninsula on all fronts. I’d never noticed that before, so you see, my geography is improving! (wink). 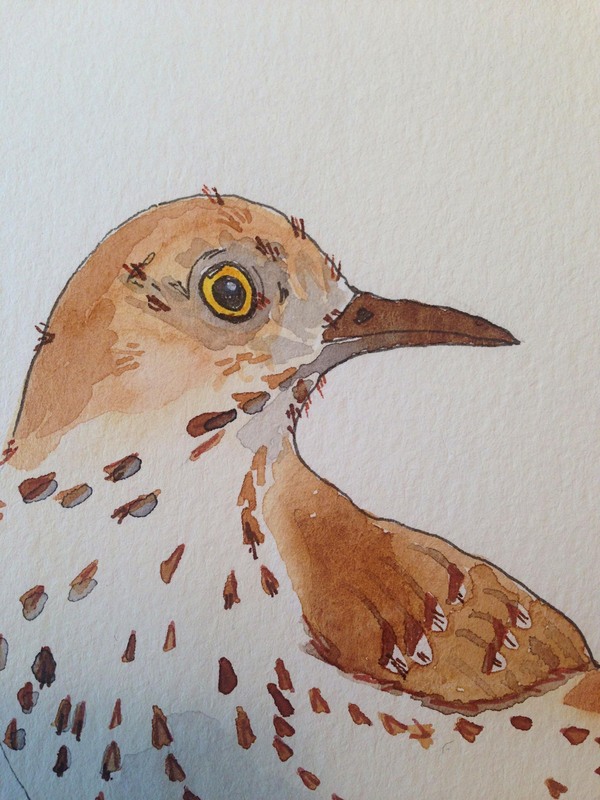 I was impressed by the variety of calls from the mockingbird, then I learned about the Brown Thrasher. This bird boasts an average of one thousand songs. Some have been documented with a three thousand song repertoire. Nature is amazing. 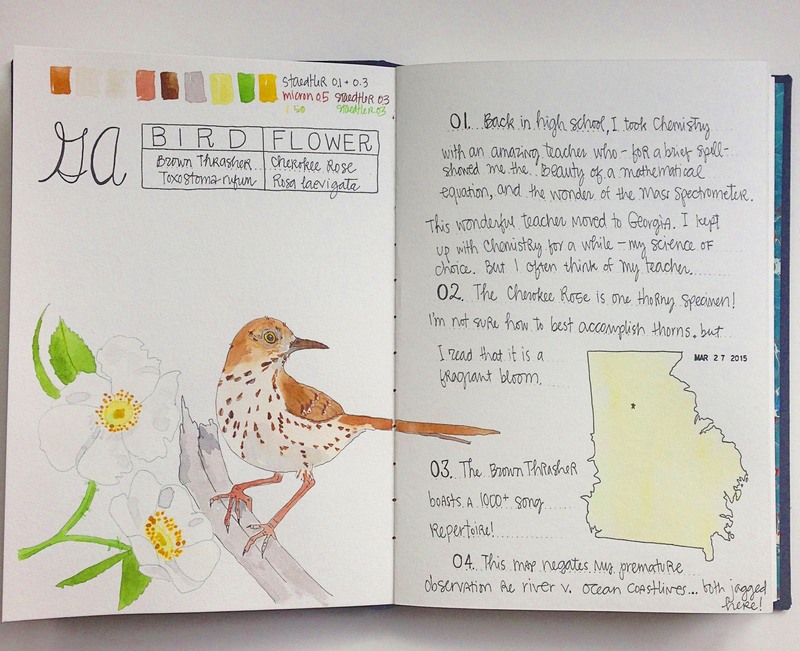 The Cherokee Rose presented the usual white flower on white paper water coloring challenge. But a little kernel of an idea is percolating in my brain about all these birds and flowers, and I think I’ll be glad that I can isolate the imagery down the road—maybe for pattern-making or collage art. Aloha. 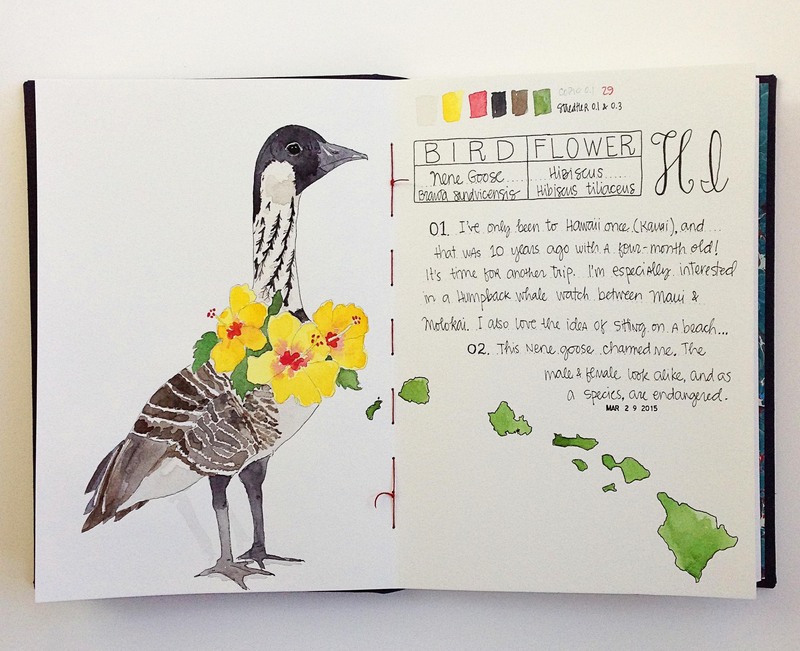 Hawaii marks my eleventh bird and flower page, and this Nene Goose was asking for a little change in format. I loved drawing this big bird, and her detailed eye and beak. On a whim, I tried incorporating the lei with the Hawaiian Hibiscus, and I’m so happy I did. I think it gives this bird even more personality. And while I initially regretted where the islands landed, it does have the appearance of leaves blowing off the lei in a windward direction. Here’s a Mountain Bluebird in mid-song! My Idaho story starts five years ago, when I participated in a Brave Girls Club art retreat hosted by Melody Ross and Kathy Wilkins. I relished a journey and an art-centric retreat. But it was so much more than art. The Brave Girls Club iconography features all different birds. 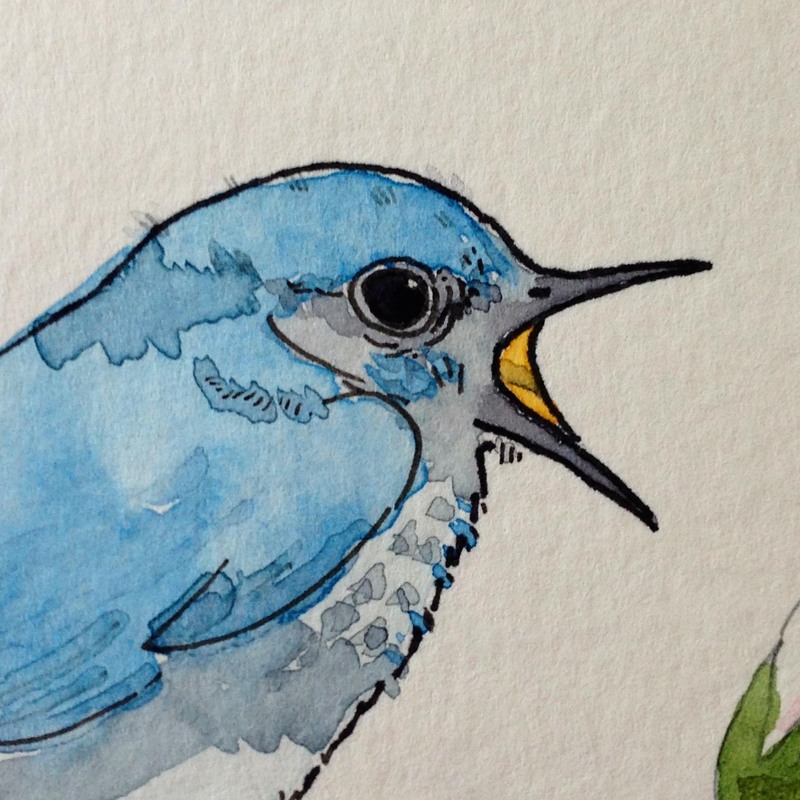 It’s completely fitting to have this Bluebird chirping the message that art saves us, and the act of creation is wholly therapeutic. Right now, I’ve drawn and painted a female Cardinal that is a lovely bird in real life, but is sort of a fail on paper. It will remain in the book and I’ll share it here soon, as I’m deciding whether to remake the page for Illinois or work on the bird. I haven’t yet had an unsalvageable piece, but I’m okay with a do-over. As always, I’m posting regular images of my progress on Instagram; follow along there if you like. Otherwise, I’ll be back soon with: Illinois, Indiana, Iowa, Kansas & Kentucky—which means a few more Cardinals. Here in California, the fifth graders learn about U.S. States. And back in December, our household was steeped in all things Massachusetts (my son’s state of choice). Each kid in his grade chose a state, and presented a full oral report, plus written and illustrated work about their state. The Massachusetts triptych was also presented to the family on Christmas night, and still sits in my living room. I’m sure all 60 kids were fatigued of their state project work by the end of it, but we needed an auction project. Auction projects are my wheel house. At our school, each classroom cooperatively creates a unified piece of art to auction off at our spring fundraiser. I genuinely love to help orchestrate these art pieces. I’ve helped: kindergarteners construct fabric collages; first graders publish their favorite sing-a-long songs; second graders vote on favorite animals and color their facets; third graders cut and fold paper houses that clustered into a chandelier; and painted leaves with cursive adjectives; string art state, and anchor. And this year, for fifth grade, I asked them to draw their state birds. I was inspired by a piece of art by Chris Waind, and I cannot resist an ampersand. 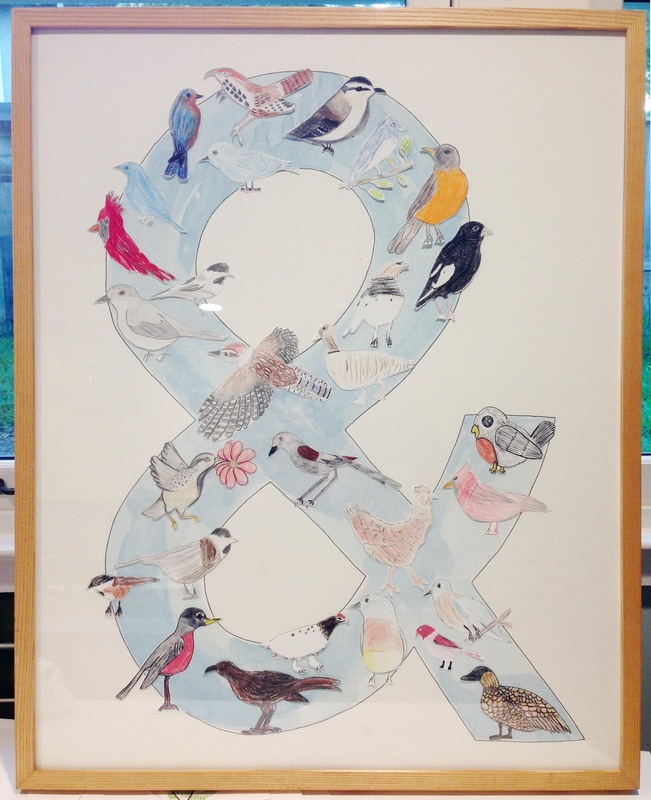 I collected all the student’s birds (drawn on the same paper stock with colored pencil), and I arranged them on a watercolored ampersand. A friend and classmate bought the piece, so we can still visit it! And I was smitten with the state bird of Alabama, the Yellow Hammer or Northern Flicker. None of the fifth graders had chosen Alabama. (Sorry, Alabama!) However, the anniversary of my grandfather’s death (who lived in Alabama for several years) was approaching, so I thought I’d draw the Yellow Hammer in tribute. It wears polka dots and a bib—irresistible. 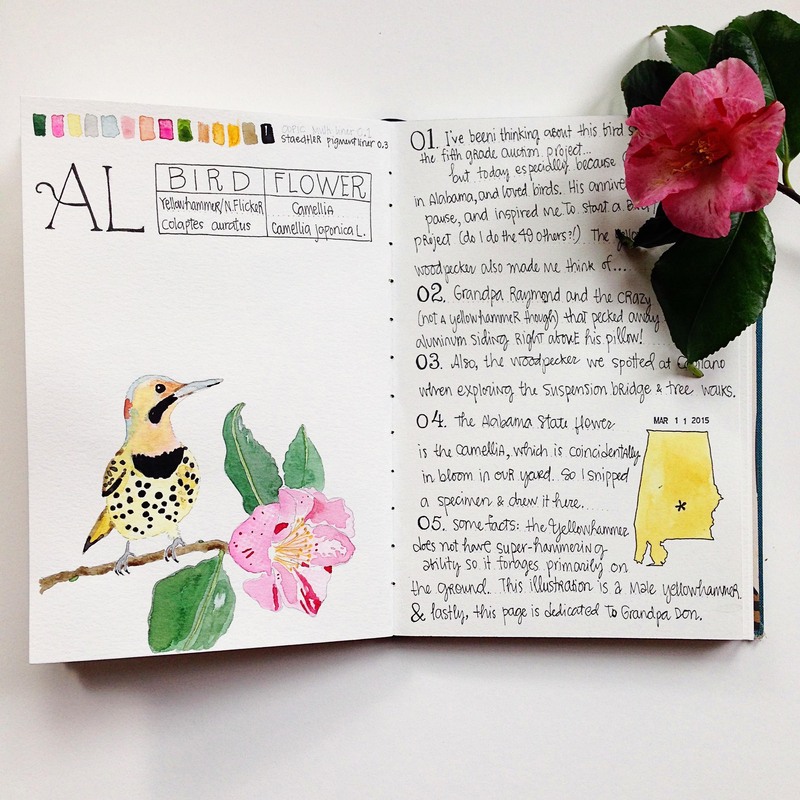 So many things came together on this page: the text box for common & Latin names, the color palette across the top, the little shape of Alabama, and the journalling—exactly nothing specific about Alabama, per se, but all the thoughts and memories and delights that occurred to me as I made my way through this process. Plus, my backyard camellia is in bloom, so I had a real-life floral model. And as I drew, and painted, and wrote, it occurred to me that this would be a fun project. 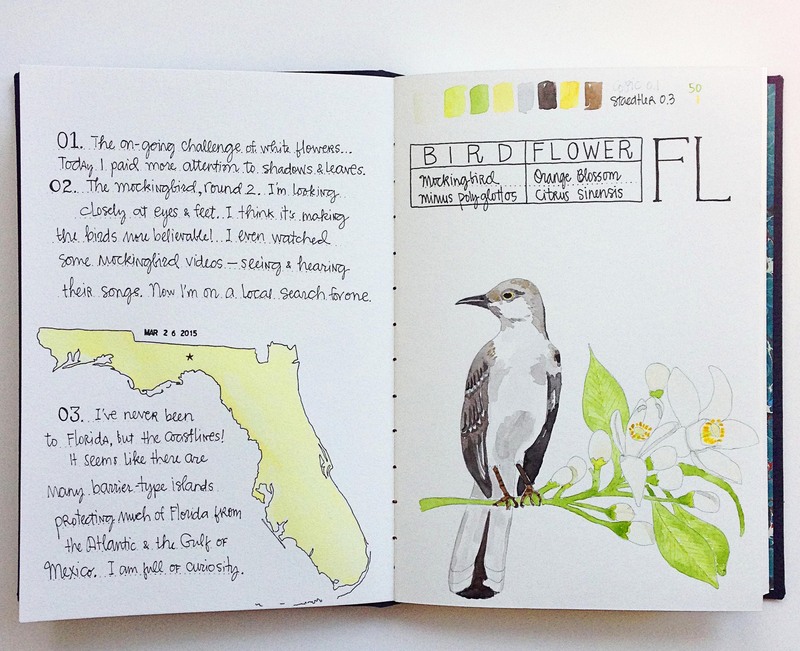 I love to draw birds and flowers. I love to draw maps. I like to write my own personal associations. And I want to improve all these skills. So thanks to California fifth grade curriculum, a project is born. It is sheer coincidence that I started with Alabama, and when I realized I could simply carry along alphabetically, I happily did! 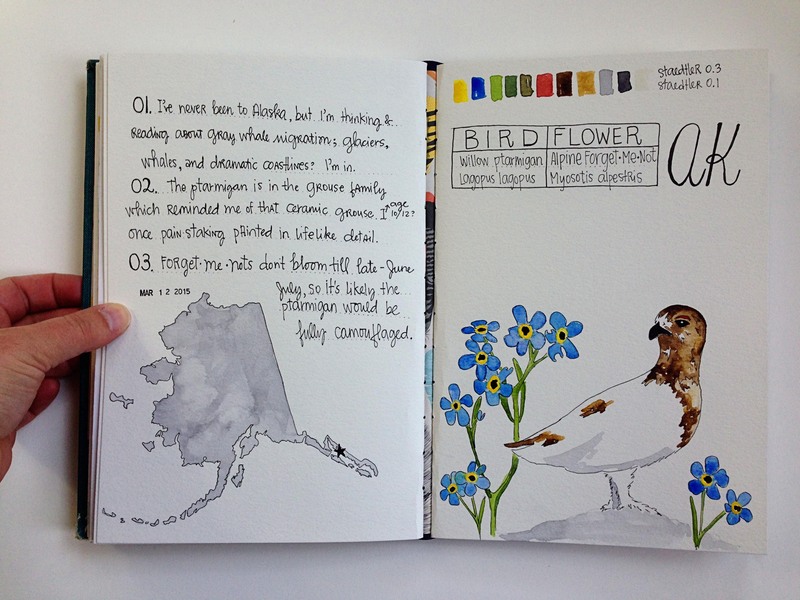 I made a seasonal error on the Alaska page since the flowers don’t bloom until mid-summer, and by then, the ptarmigan would likely be sporting full, deep brown camouflage. But I am okay with this mistake! I would never have even known about the camouflage had I not embarked on a bit of research. When I started Arizona, the doubt crept in. I’ve never been to half the US states, and only driven through Arizona—who am I to write anything about it!? But, the Seguaro cactus bloom challenged and enchanted me. I truly wanted to attempt it. White flowers are tricky with watercolors, and demand either masking or fierce control. (I have neither). But shadowing helps, and I made rough attempts at it. Arkansas, another state that I’ve only seen from the highway, is one of five states to claim the Mockingbird. Am I going to tire of drawing mockingbirds? Especially since the male and female look similar? I like this first attempt even though I cheated. I used ink for the white feathers, and a big bold brush marker to darken the space between the white ink. 1) research the state bird and flower, including Latin names (which always interest me), noting any interesting facts. I also jot down any associations that I have with the bird, flower, or state. 2) find photographs of the birds and flowers. I like at least five or six photos, especially of the bird in a variety of portraiture. And anything that details the plumage. I always work from photos, and am thankful for all the nature photographers who post their work on the internet. 3) sketch out the bird/floral arrangement. Hand-draw the text box, and state abbreviation. 4) I usually outline with ink the bird and flower before I paint them. I have been alternating between a light grey pen and a black pen. I haven’t settled into a rhythm for this part yet. 5) find a map of the state, and free-hand draw it on the facing page. No scale or anything, just paying attention to the general shape, and placing a star at the approximate capital. (Alaska was WILDLY difficult to draw!!) Then I use a pattern marking tool that was my grandmother’s to ink in journalling lines. It’s faint, and fast. 6) watercolor! I play with palette on scrap watercolor paper, and once I settle on a color, I dive in. I try to work from lightest to dark, but the bird feathers do not make this easy. 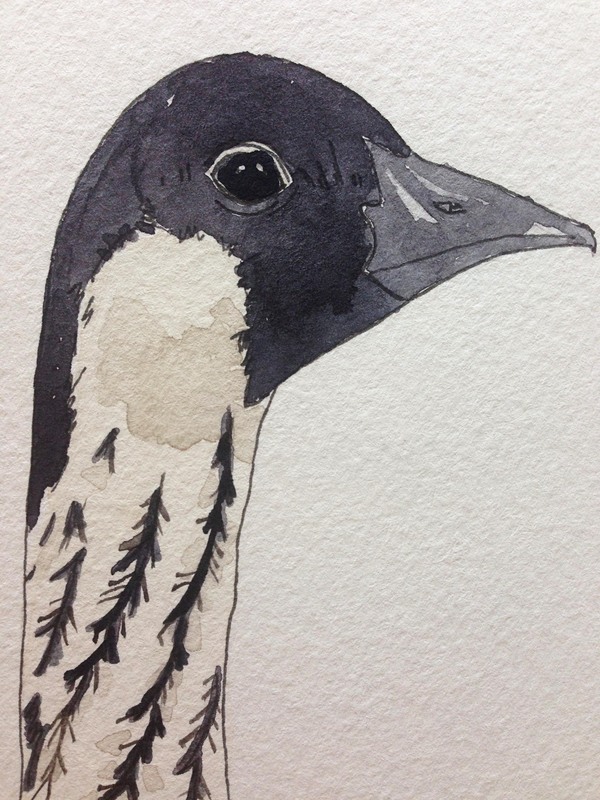 Lately, it’s been very dry, which makes watercolor painting a step more challenging—it dries within a minute or two! What’s next? 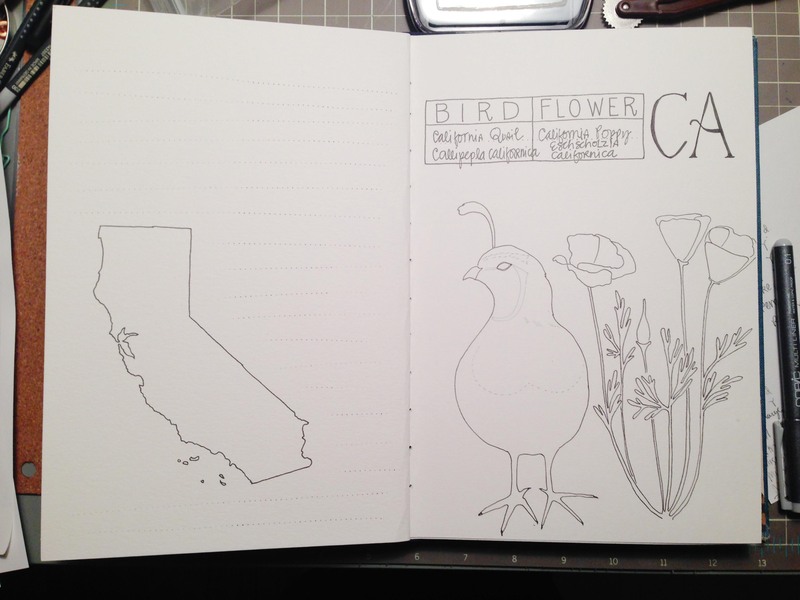 The California Quail and Poppy are in pencil form, and being that this is my home state, I want to get it right. I started a Pinterest board for collecting. And I need to make another sketchbook to continue this project along since I’ll run out of pages before Delaware! My intention is to post the photos here after every four or five states. (The A’s are all done!) I hope you’ll follow along. Every year, instead of making a resolution, I choose a word and let that word infuse my whole year. This concept came to me from Ali Edwards. She’s the creator of the on-line class One Little Word. You can read for days about this project here. I’ve had a word for the past five years: focus, unruffled, dare, effort, and one I cannot remember because I didn’t document it at all. 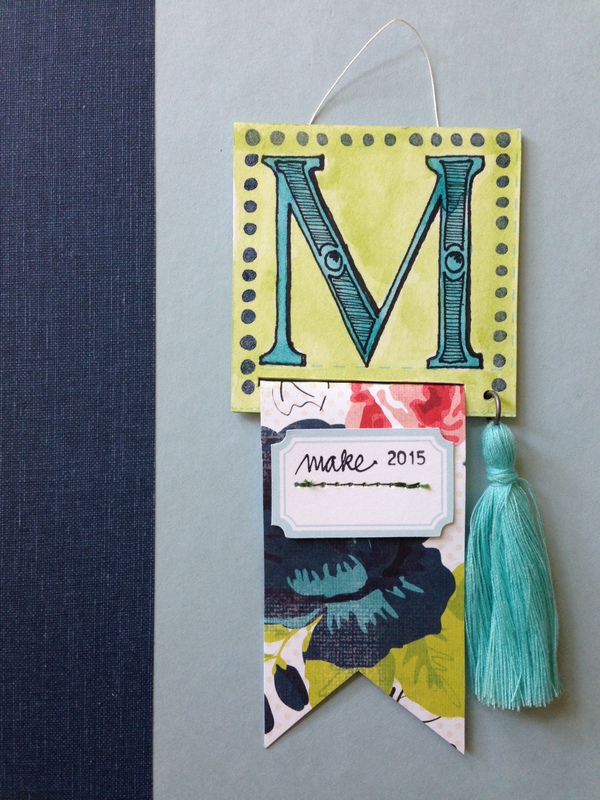 This year my word is: MAKE. It is an action-packed, externally-focused, see-results kind of word (unlike focus, unruffled, and dare). It is an extension of 2014: effort. I really tried to find a word that embodied the create-more-than-I-consume mantra. Make is just simpler. So, I intend to make something creative or make progress on something artful every day, including a weekly prize-type thing. “Thing” is a vague description, I know, but I want these prizes to be varied. I also plan to make nutritious meals. I cook now, but I want to include new foods that we haven’t tried. I want to USE my cookbooks (or pass them on if they don’t inspire). I want to make gorgeous salads for myself at lunch, and I think the key to this is Sunday preparation and a heavy-duty mandolin. This year, I also want to make connections with other makers. By nature, I am introspective, and thrive on solitude. As a result of all my making things, I plan to share them here, and on Instagram (which is instant gratification for all). I hope I can strike up more on-line conversations and inspiration. 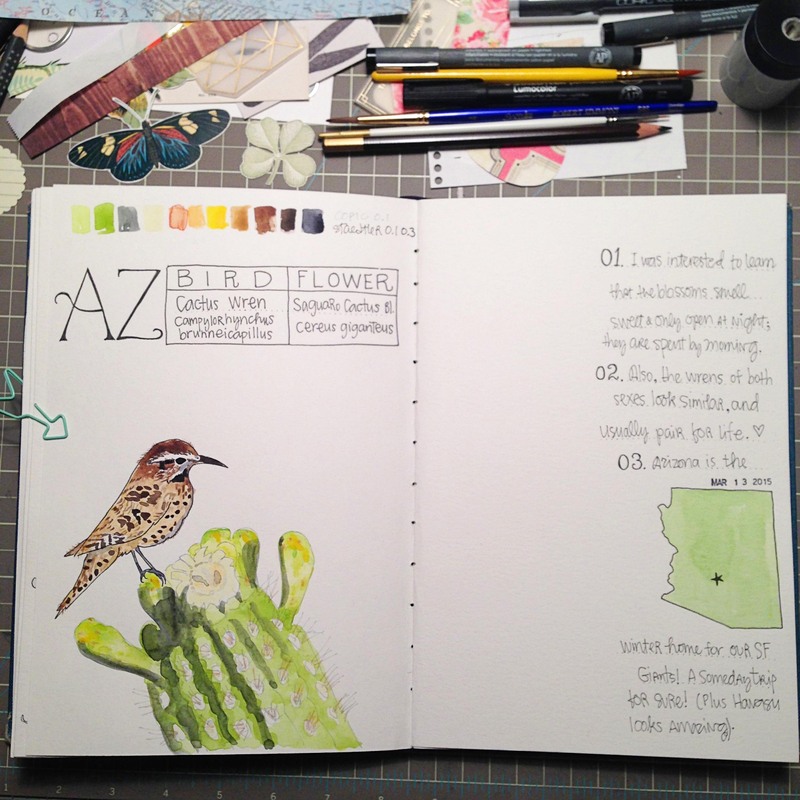 In a dual effort to create & connect, I am taking an on-line art class called Sketchbookery. 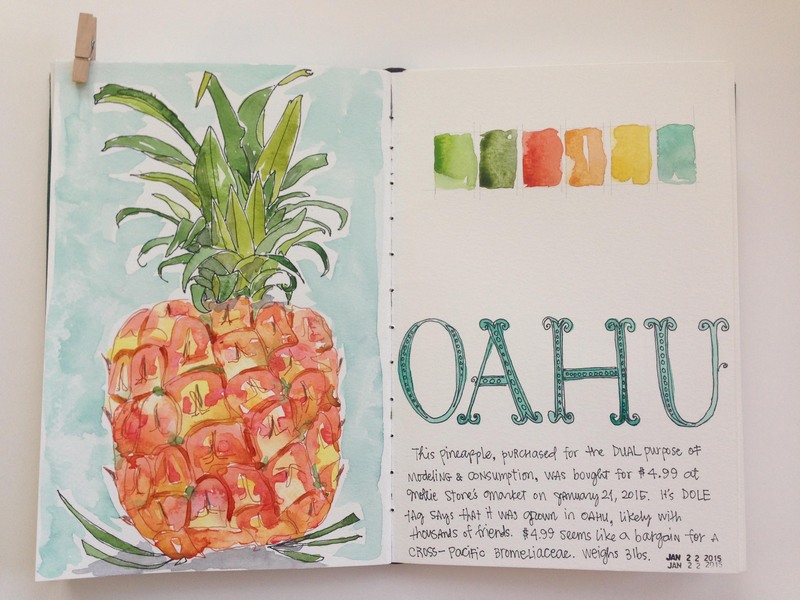 Sketchbookery, taught by Mary Ann Moss, is a class about cannon-balling into a set of watercolors. It’s a class about looking at the things that surround us all. It’s a class about making spectacular mistakes—for me, anyhow, I won’t speak for the group. 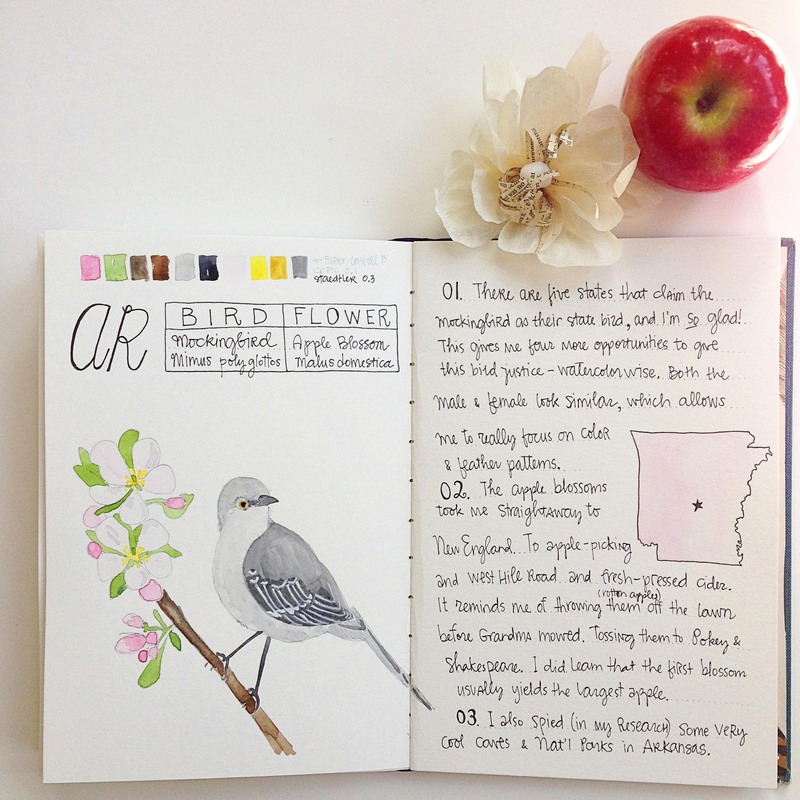 Mary Ann guides you though the building of a sketchbook or two, and the filling of those sketchbooks with watercolor drawings of a wild variety of things, all at one’s own pace. 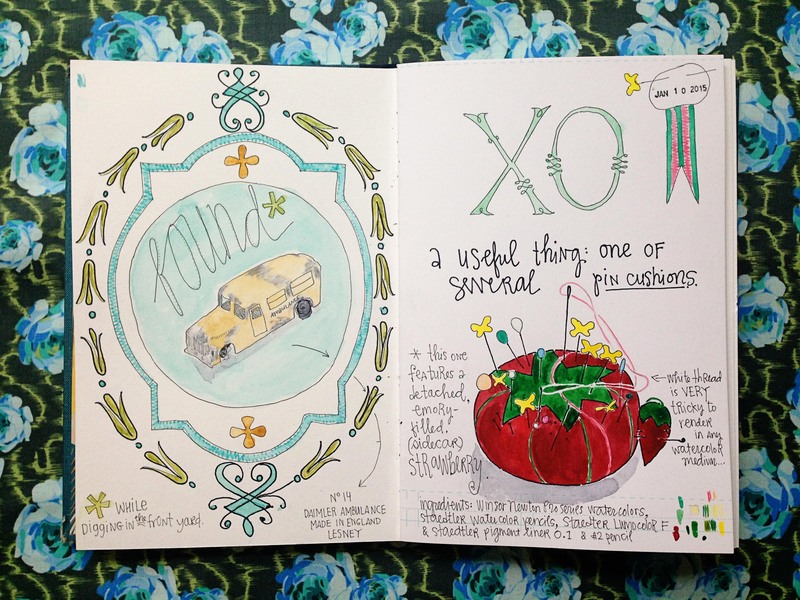 I made my sketchbook from an old Good Housekeeping Cookbook. I gutted the book, and will use the book block in another project. 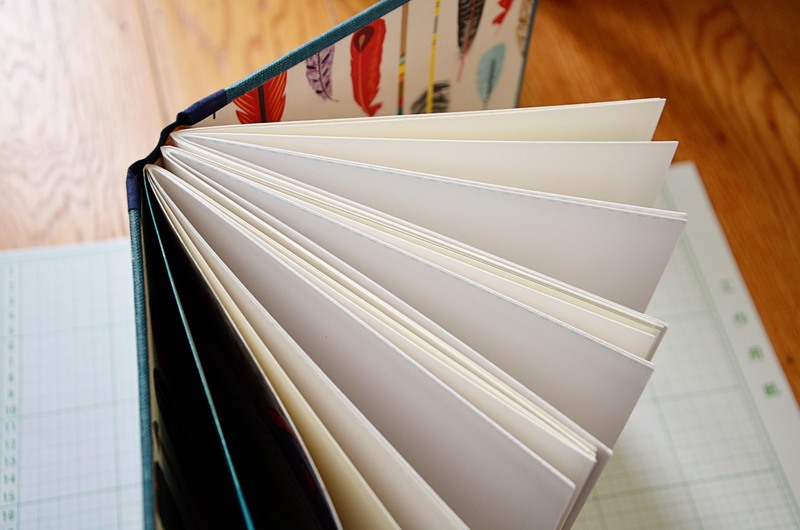 The three folios are made up of heavy watercolor paper and illustration board, and stitched to the reconfigured spine. I covered the frontispiece with decorative feather paper, and drew a graphic frame for the introduction page. It was the first time in many months that I water-colored anything, and it should have been easier. I simply didn’t make enough of the color, and while I was mixing and testing a new batch, it dried splotchy. I blotted a puddle with a paper towel, and it left an impression that I liked. But in all, it needs something. More color, perhaps. Then I dove in to the prompts and drawing portion of the class. The frame, truth be told, was painted first even though the starting prompts were blind contour focused. I needed to *just start* somewhere, thus a frame was born. 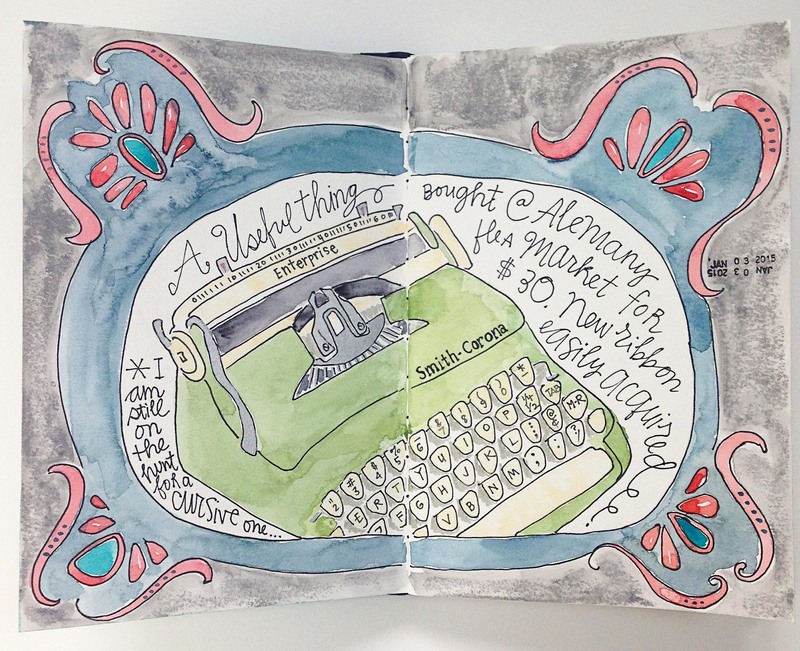 Then I drew and painted an old Smith Corona typewriter that I use all the time. I always think of that Williams Morris adage: “Have nothing in your house that you do not know to be useful or believe to be beautiful.” This old typewrite nails both categories. I even had a pan of silver paint in a vintage set so the chrome bits are done up right. 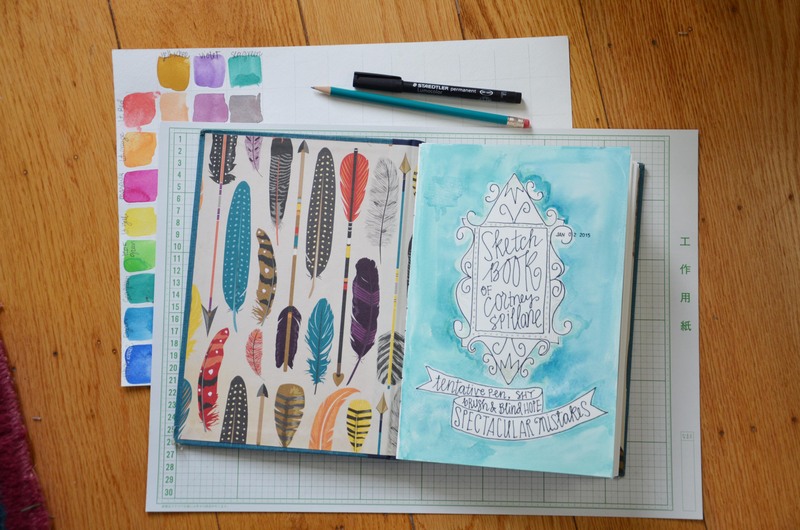 Mary Ann often titles and/or journals on her pages, and her fonts and journaling was what initially drew me to her style. Besides, I think in words first, so everything needs a bit of text on it. I will forever journal on the page, since the story behind the Useful Thing is as much a treat as the painting of it. Letting go of perfection is hard work, though! And it’s probably my chief struggle with any art form. Since I love to create, I muster along. My sketchbook challenges thus far include shadows. Shadows are such a simple thing, in theory. They lend gravity to each fork, each leaf, each old car. I used neutral tint grey to establish the shadow under the pin cushion below. I have a Faber Castell brush pen in grey that works for shadowing. Mary Ann uses blue grey paint, which lends a virtuous shadow. My real problem is when I start a drawing, and then move locations or wait till later, shadows (and glares) have moved. Ah, the passage of time, and the call of children… Part of my real challenge is letting go of making it perfect, and/or rapid-capture of the shadow and highlight. Yet, part of the joy is really looking, and noticing the curves and soft edges of a mid-day shadow. I also struggle with replicating symmetry. 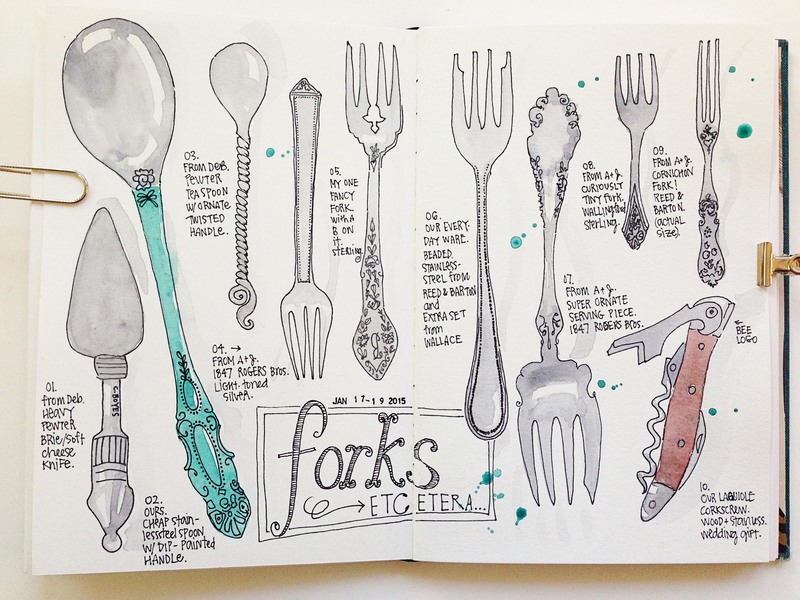 What my hand did on the left curve of a fork is not what it mirrored on the right, even after drawing nine forks! I woe the day when I challenge myself to draw a vase, or a set of curvy hips, (or—dare I even suggest it– a portrait!!). 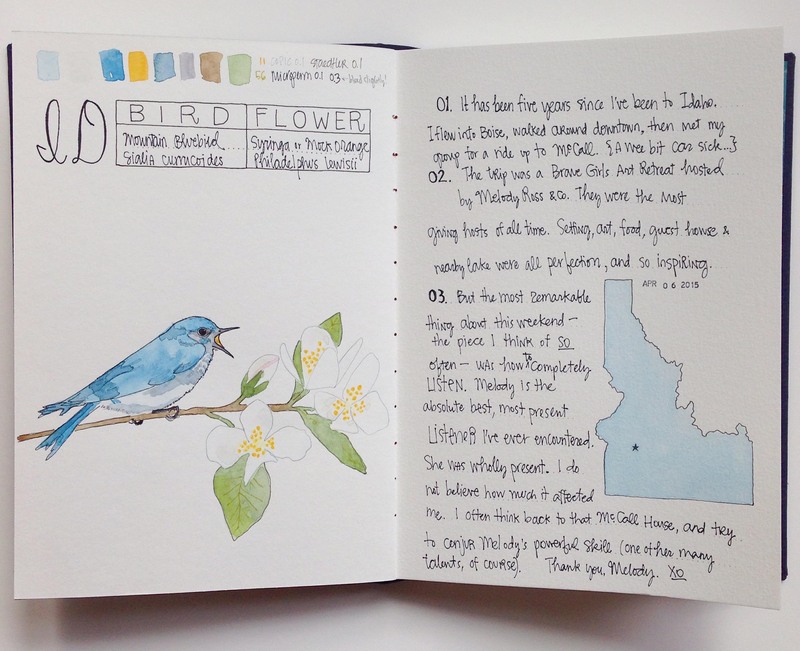 Lastly, I wish I had made the entire book out of watercolor paper. Since I’m just learning and playing, it doesn’t matter much, but it would be one less variable if the paper were uniform. You’ll note that I’m not fretting here about my drawing skills. 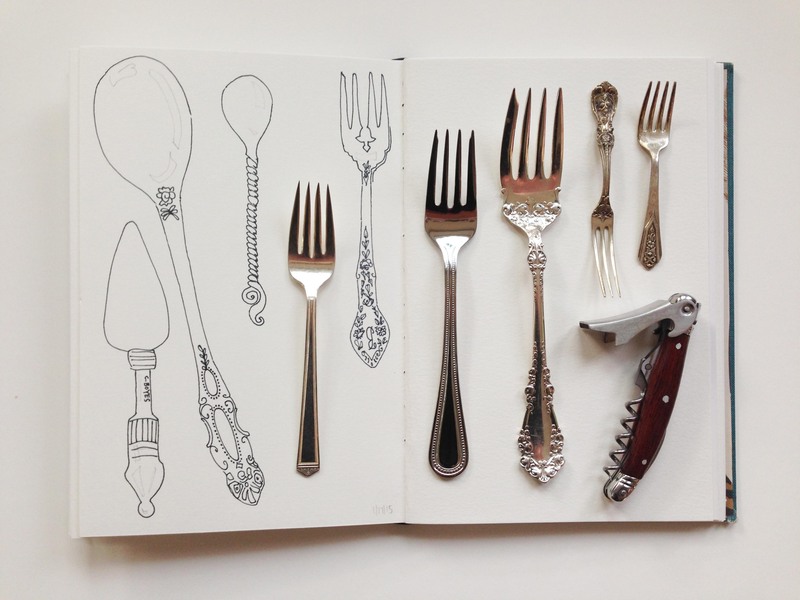 They are representational, they are my style, and they may–or may not—improve with practice. No matter, because I absolutely love getting lost in a drawing. I’m finding small successes, too. I adore being able to sketch nearly anything, nearly anywhere. The portability of it allows for me to be creative on the go: from an airplane seat! from my driver’s seat! to a park bench! I like the effect of drawing with a black 0.3 pen, then coloring in with paint. And I appreciate Mary Ann’s suggestion of fancy alphabets to title and label one’s sketches. I will continue to MAKE brave and daring representations (or spectacular mistakes) of Beautiful & Useful Things. PS: at time of press, I just finished this pineapple. Said pineapple was drawn and painted whilst supervising a homework session with my 5th and 3rd grade boys. Also while enjoying a mug of green tea…into which I accidently dipped my paintbrush! Oh, the perils of watercolor painting at the dining room table!